The Sixth Doctor and Mel land in a strange station. They discover they're in Tanatne Spaceport just as the Tardis is pulled into the station. The spaceport is locked down due to quarantine. Meanwhile, an Economy clan girl called Naysmith tries to complete her coming of age test by stealing food from the Business clan. Things go further awry when the ancient force known as the Wailer is unleashed. This story utilizes the generation ship idea within the confines of a quarantined spaceport. The Business versus Economy idea is a good one with the class warfare theme being a running undercurrent. There is also a bit of genius involving cell phone games of all things. The Sixth Doctor is a font of intelligence and wit. He has never been one to trust in authority or to abide by the status quo, and this episode really gives him some things to work with. 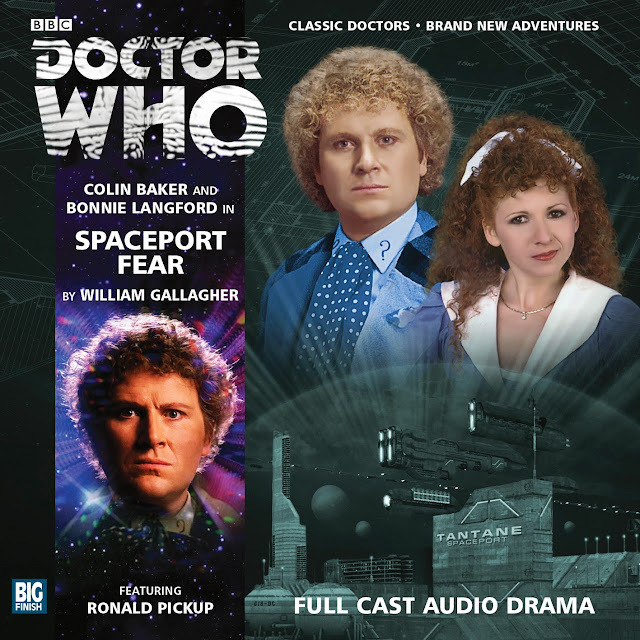 As always, the Sixth Doctor is a highlight of the episode, caring for all the spaceport survivors and even the monster. Mel won't let the Doctor outshine her. She's just as feisty in her protection of the other characters and the Doctor. Unlike the last outing, Mel gets plenty to do and takes custody of the naive Naysmith. Naysmith is an idealist who follows the Doctor and Mel in hopes of a brighter future for her people. She's doesn't get the plot reveals for most of the audio, making her seem somewhat slow. She is a bright spot in what could have been a dreary episode, though if there's one thing that Sixth Doctor audios do it's entertain. Pretty is Naysmith's plus one: read boyfriend. Unlike the compassionate Naysmith, Pretty is a freedom fighter who works to further the cause of his people. The role is a bit played out, but he lends understanding to the other natives. The Wailer is a terrific monster, though it sounds like "whaler" during the audio. Its wail and the dread is causes between both Economy and Business. It wrecks and devours its way through the episode, though there is more to it than an engine of destruction. The Director is a villain who hides behind the rituals built since the station's lockdown. He's in it for the slow game; the snail paced game. He never quite made it to menacing, but he gives it a good go. The writers really busted out the thesaurus for this one. The play on common airport features is executed with thoughtfulness and the puns are funny. The place comes alive with announcements and blasts. Even the Wailer's vein of destruction comes through load and clear. A satisfying ending to a good tale, though the villain's plan does come off as rather stupid. Some unique ideas mix with a solid sci-fi plot to produce a good episode. The Director is probably the weakest part, since his plan was as brilliant as it should have been. Still, his is a good entry in the series, but not as interesting as the Wrong Doctors. Check it out for more Six.